Time does seem to fly- especially when you do not want it to, but not much that I can do about that, the same as the weather. California usually has great weather most of the year round, but last month we were plagued with the most rain ever recorded in the history of weather measurements, this severely held me back in the tear down of the bike as I needed to move stuff out onto the driveway to give me access to grinders, welder and tube bender etc. And I am sure that you have experienced the same as me when it comes to a deadline? So, I put together the Vesco Honda with bits and pieces I had in and around the garage, just to see if it would even run, low and behold it did and you know the deal, you add this and that and before you know it the bike is on the tarmac and you are ripping through the gears. I was going to simply enjoy this bike for a while and get as many miles on the thing as I could as I tell ya, it’s a hoot to ride, plenty of linear Power and turned heads all over the place, but then I get an email from Jay LaRossa to be invited as a Custom Builder for their up and coming show on the 23rd of March, so as I had almost 2 months I took the challenge, then the California weather took a huge dump for a month and has had me side railed for ever. I managed to strip the bike down to the frame as you lot may know as I have blogged all of it on here, but so many hurdles still to overcome and now I have 9 days to completely rebuild this bike, I still do not have the frame back from the paint shop as its been to cool and damp to spray clear coat on the old metal-flake, so here I sit and have been doing little jobs like designing and making a New Stainless Steel exhaust system, and then set about stripping old parts and re-chroming them etc. The Rims now have the old tires off and a quick repaint, cant go crazy as time constraints have kicked me in the plums, so just Black and will fit Road tires this time as Diamond tread tires I wanted are on the East Coast and will not get here in time for the show. So I am giving it a go to get as many small things done as i can to try and see if I have a shot at getting this together in time, but I cant build anything until I get the frame back from the paint shop, then i can add the forks and swing arm and wheel and then fit engine and rewire etc, a daunting task thats for sure. But, if I cannot get it completed in time, well- I tried and tried hard and do not want to show a bike half finished, that would be awful, so with a few days still left, I am hoping to have the frame back tonight and if its dry enough, i can start bolting parts back on the bike- I love that part as you see a completely different looking machine starting to come together, it is so satisfying to sit back and look at the completed machine and think to your self- jeez, I created that, its an awesome feeling that I know many of you get too. 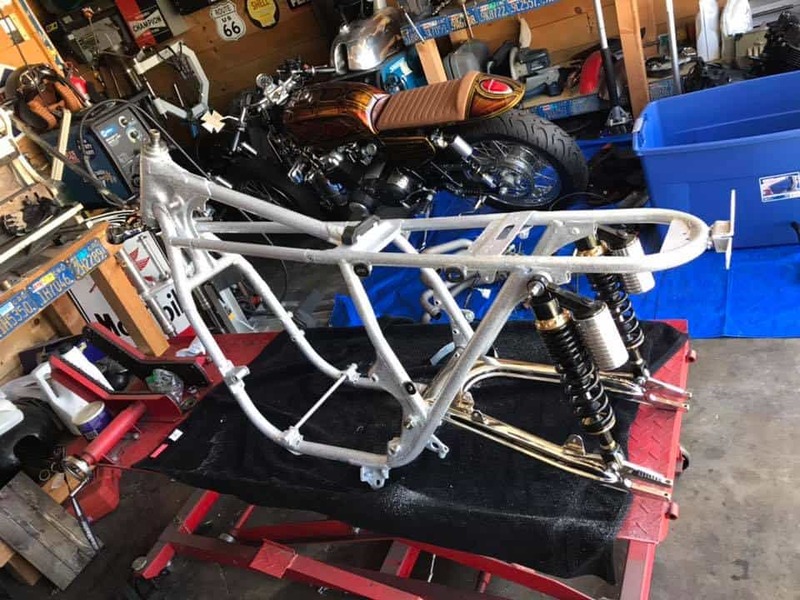 This entry was posted in Blog and tagged 750-4, 760 honda, brat, Built at home, candy paint, carpy, cb750, Custom built, Diamond stitch, garage built, Honda, inline four, Lester rims, metalflake, sohc, Tuck n Roll, Vesco, yoshimura.